Held on October 23 and 24, 2016 in Kalamazoo, MI. The finest curriculum on holistic skin care to be found anywhere. 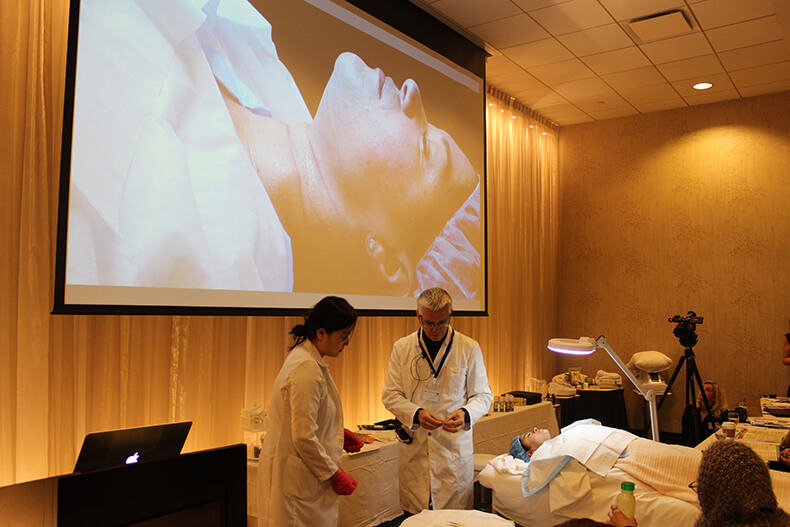 Dr. Andrey Lutskovsky will show the procedure and discuss how different types of threads support the tissue and help to rejuvenate the skin and stimulate more collagen production. Elina Fedotova will demonstrate a corrective face treatment which will include her latest formulations with natural peptides, crushed pearls and botanical alternatives to chemical peels. A panel of the Association of Holistic Skin Care Practitioner's experts and board members, which include medical doctors and holistic professionals, will discuss holistic solutions for cystic acne, rosacea, and dermatitis. What Is Your Skin Telling You About Your Health? This workshop will explore skin from the inside out looking at internal and external factors that impact vibrant skin. Anxiety, depression, learning disorders, loss of focus and energy, and other ailments can stem from bio-chemical imbalances. This workshop will discuss how the methylation cycle and mineral/vitamin imbalances impact hormonal balance and health, and discuss diagnostic tools to determine and help guide us in treating these imbalances. In this hands-on workshop, you will learn the benefits of sugaring hair removal, and you will learn how to make a safe and edible epilatory product for your clients. Tara demonstrates the use of bowls for vibrational sound treatments. Jessica Silber, will discuss how Chinese Medicine and acupuncture can help treat many types of hormone imbalances for all ages. Examples include: Fertility problems, pregnancy, skin issues such as acne, hair loss or greying of hair, women's menstrual cycle irregularities, PMS, and menopausal symptoms. Dorothy K. Ederer presents morning meditation. Essential oils, the life force of the plant kingdom and for the holistic practitioner, offer an abundant source of therapeutic applications which may be employed in the management of rosacea and sensitive skin subtypes, as well as substantiating viable support for general well-being. Reading ingredients lists for makeup lists can be very complicated. Elina will discuss the safety and toxicity of ingredients commonly found in makeup products. Doug Lofland, a science orientated industrial developer, has spent 25 years learning everything he could about the various anti-aging processes, and then trying them on himself to see if they work. I feel it was the best conference yet. It was jam packed with new information and new protocols and new products and great networking and everything about it was amazing! Well done! !